A top Hindu priest was decapitated by attackers in northern Bangladesh Sunday and two worshippers wounded, police said, in the latest assault targeting minorities in the Muslim-majority nation. "The priest was preparing for morning prayers when they pounced on him and slit his head from the body at the verandah of his home inside the temple," said Shafiqul Islam, a government administrator in the sub-district Debiganj where the temple is located. "We recovered a blood-stained cleaver from the spot," he said. Two devotees were wounded in the attack including one who was shot as he tried to save the priest, he added. The motive for the murder was not clear but police said Islamist militants were among those suspected as being behind the killing. "The Jamayetul Mujahideen Bangladesh (JMB) is also in our list of suspects," Ahmed told AFP. The banned group is believed to have been behind an attack on an Italian Catholic priest in the neighbouring district of Dinajpur late last year. Bangladesh has seen an upsurge in attacks on minorities including Shiites, Sufis, Christians and Ahmadis by Islamist militant groups. The government rejects the Islamic State's claims of responsibility for several recent attacks, including the shootings of two foreigners. Prime Minister Sheikh Hasina's secular government instead accuses the JMB, other local militant groups as well as the Islamist-allied political opposition of trying to destabilise the country. Hindus, the country's largest minority, make up nearly 10 percent of Bangladesh's 160 million people. Security forces thwarted three potential stabbing attacks in the West Bank on Sunday before noon. A female Palestinian teenager was arrested with a knife after security forces determined she was acting suspiciously near the Tapuah junction in the West Bank on Sunday. Initial investigations indicated that the 17-year-old suspect from the West Bank village of Kutzra had arrived at the scene inspired by incitement on social media, intending to carry out an attack against Jews. Police reported that during the incident, security forces stationed near the flashpoint intersection called on the suspect headed toward a hitchhiking spot to stop, but she refused to heed their calls and continued advancing toward them. The patrol's commander cocked his weapon in her direction, after which she walked a few meters and halted. When asked to raise her hands, the security forces then saw a knife in her hand drop to the ground. The teen was taken in by security forces for further investigation. Later in the day, a 14-year-old Palestinian with a knife was arrested by security forces near Hebron. There were no injuries on the Israeli side. Security forces were investigating the suspect. Shortly afterward, a third attempted stabbing took place at Habitot junction near Nablus. The stabber was shot and killed. During the attempted attack, the assailant approached military forces stationed at the scene and attempted to stab a solider. No Israeli forces were wounded in that incident. A Palestinian man was killed Friday afternoon as he tried to carry out a car-ramming attack against Israeli soldiers in the northern West Bank. The troops spotted the driver as he directed his vehicle at them during riots in the town of Silwad, the Ynet news website reported. They opened fire on the man and killed him, Army Radio said. There were no Israelis wounded in the attempted attack. The attempted attack occurred at the British Police Junction, at the entrance to the village near Ramallah, the radio said. "During a violent riot in Silwad, northeast of Ramallah, an assailant attempted to ram his vehicle into soldiers," the army said in a statement. "The soldiers responded to the immediate threat and fired towards the assailant, resulting in his death." Palestinian police sources identified the man as Raed Hamed, 20. His body was later handed over to the Palestinian Authority, the Walla website said. The attempted attack came hours after two Border Police officers and a bystander were injured in a stabbing at Jerusalem's Damascus Gate on Friday morning. One officer was stabbed in the upper body and moderately hurt. The other was stabbed in the arm and was in light condition. Both officers, in their early 20s, were taken to Jerusalem's Shaare Zedek Medical Center. According to the Magen David Adom ambulance service, the bystander, identified as a 50-year-old Palestinian woman from East Jerusalem, was hit in the leg by fragments or ricochets from the shots fired at the assailant by security forces. She was lightly hurt. After being treated on the scene by medics, she was taken to an East Jerusalem hospital. Later on Friday, two Palestinian protesters were injured by IDF fire during clashes near the northern Gaza Strip, Palestinian media reported. According to the Walla News, Israeli soldiers opened fire on the protesters adjacent to the Erez border crossing after dozens approached the border fence and began hurling rocks at army patrols. In similar demonstrations further south along the border fence, protesters inside the Palestinian territory hurled rocks and rolled burning tires at IDF soldiers near the al-Bureij refugee camp and in the Nahal Oz area. An 18-year-old Palestinian attempted to stab Border Police forces in Jerusalem's Old City on Saturday evening but was stopped and arrested. No Israeli troops were hurt in the incident. Police spokeswoman Luba Samri said security forces at the Damascus Gate approached the young man, who was behaving suspiciously, when he pulled out a knife and tried to stab them. The troops subdued and arrested him, aided by a trained dog. Regional police commander Haim Shmueli said following the incident that policemen's vigilance "proved itself, preventing harm to human lives." It was the second attack at Damascus Gate over the weekend. On Friday a Palestinian attacker was killed as he carried out a stabbing attack there that left three people wounded. Earlier Saturday a 13-year-old was caught in Hebron with a knife which he said he had intended to use to stab soldiers. Troops found the weapon while searching the child at a checkpoint outside the Tomb of the Patriarchs. Also in Hebron, security forces detained 12 Israelis on Saturday as they joined a commemoration for 29 Palestinian worshipers killed by Jewish terrorist Baruch Goldstein in 1994. Some 200 people, most of them Palestinians, took part in the anniversary demonstration which was dispersed after some protesters threw stones at troops, an army spokeswoman said. Army Radio reported that the Israelis were detained for entering Palestinian-controlled territory without authorization. In other security incidents Friday, troops killed a Palestinian as he tried to ram his car into them at a junction near the village of Silwad, near the West Bank city of Ramallah. Another man died after being shot during a clash with IDF troops in the West Bank. The IDF said that he and another protester had been shot after opening fire at troops on the scene. The second protester was lightly hurt. Since October 1, Palestinian knife, gun and car-ramming attacks have taken the lives of at least 27 Israelis, an American and an Eritrean. At the same time, over 175 Palestinians have been killed by Israeli forces, most while carrying out attacks but others during violent clashes and demonstrations. In a bizarre move, a court in western Cairo this week sentenced a four-year-old boy to life in prison on various heinous charges, including murder. The child, Ahmed Mansour Karni, received the lengthy prison term Tuesday after being convicted in absentia of offenses that allegedly occurred two years ago, when he was a mere two-years-old. The boy was listed as "wanted" for murder, disturbance of the peace and damaging state property in an indictment that listed 115 other defendants sentenced to life imprisonment. According to the indictment, the exorbitant charges against the youngster include four counts of murder, eight counts of attempted murder, vandalizing property belonging to the Egyptian Health Administration in his home province of el-Fayoum (located some 70 kilometers southwest of Cairo), threatening soldiers and police officers and damaging vehicles belonging to security forces. One defense attorney added that he had presented the child's birth certificate to the court, however "it appeared that the court did not transfer the material." Lawyer Faisal a-Sayd charged that the presiding judge had not reviewed the case. "The child Ahmed Mansour Karni's birth certificate was presented after state security forces added his name to the list of accused, but then the case was transferred to the military court and the child was sentenced in absentia in an ensuing court hearing," said the defense attorney. "This proves that the judge did not read the case," he added. Another Egyptian lawyer Mohammed Abu Hurira issued a fiery response, writing: "On the eve of injustice and madness in Egypt, a four-year-old child was sentenced to life imprisonment. He is accused of disturbance, damage to property and murder. The Egyptian scales of justice are not reversible. There is no justice in Egypt. No reason. Logic committed suicide a while ago. Egypt went crazy. Egypt is ruled by a bunch of lunatics." The sentencing also caused a firestorm on social media networks, with users blasting the Egyptian legal system and government of corruption and injustice. The blogger and wife of Egyptian human rights activist Nibin Melek wrote in a post that the sentencing "was a blind decision." The court order came less than a year after a blind man in Egypt received a 15-year prison sentence for the shooting of a police officer. Cuban dissidents pose wearing masks depicting US President Barack Obama and holding pictures of imprisoned dissidents. Muslim prayers on Fridays at the United Nations headquarters in New York have begun taking up a large area next to the General Assembly Hall, shunning a designated ecumenical prayer area. There was no formal decision by the UN to host Muslim prayers. The space has simply been booked without further explanation. 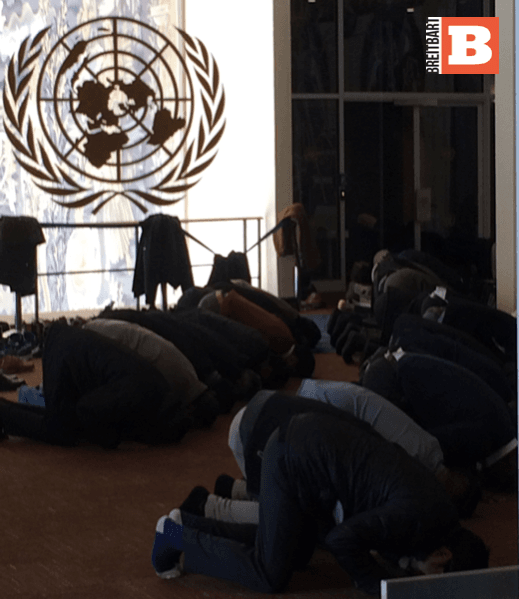 Muslim prayers at the UN have been operating for some time, though UN staffers are tight-lipped about when they began and who started them. There is an ecumenical "meditation room" – without religious markings – that is continually open to the public and adherents of any faith. A plaque outside explains that the room was "personally planned and supervised in every detail" by former UN Secretary-General Dag Hammarskjold in 1957. Hammarskjold's aim was to create "a place where the doors may be open to the infinite lands of thought and prayer. People of many faiths will meet here...[I]t is dedicated to the God whom man worships under many names and in many forms." 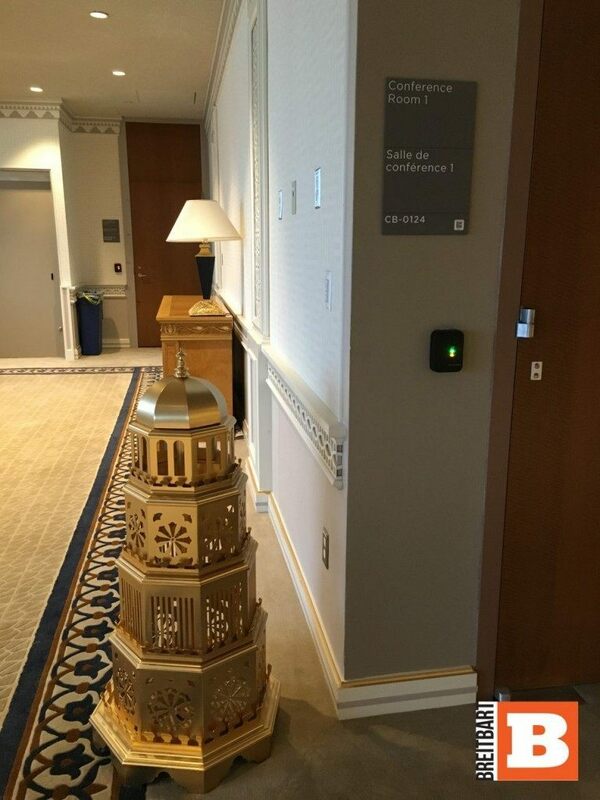 Prior to recent renovations, Muslim prayers had used a remote venue on a floor above the library. 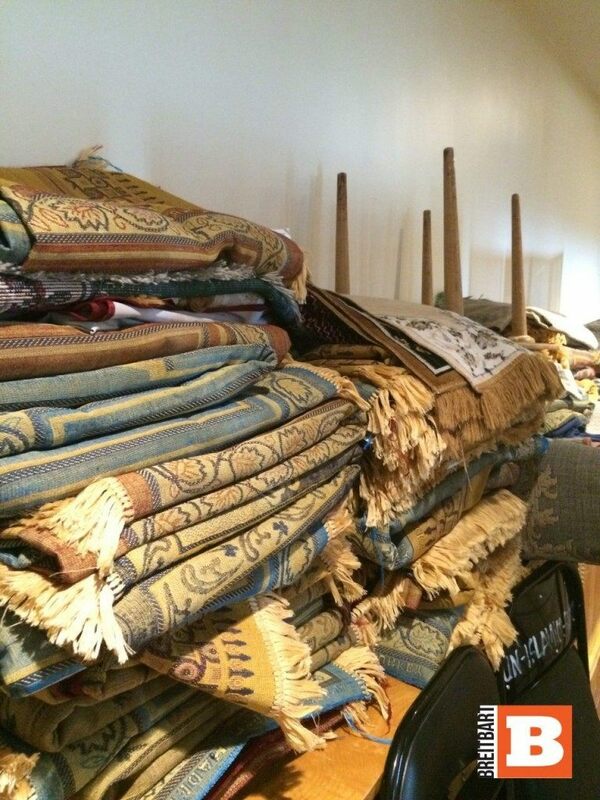 Today, one finds dozens of prayer rugs permanently set aside for use every Friday in the General Assembly building. The space is booked – the UN won't say by whom – from 11:45 a.m. to 3:00 p.m., and unavailable for anything else. 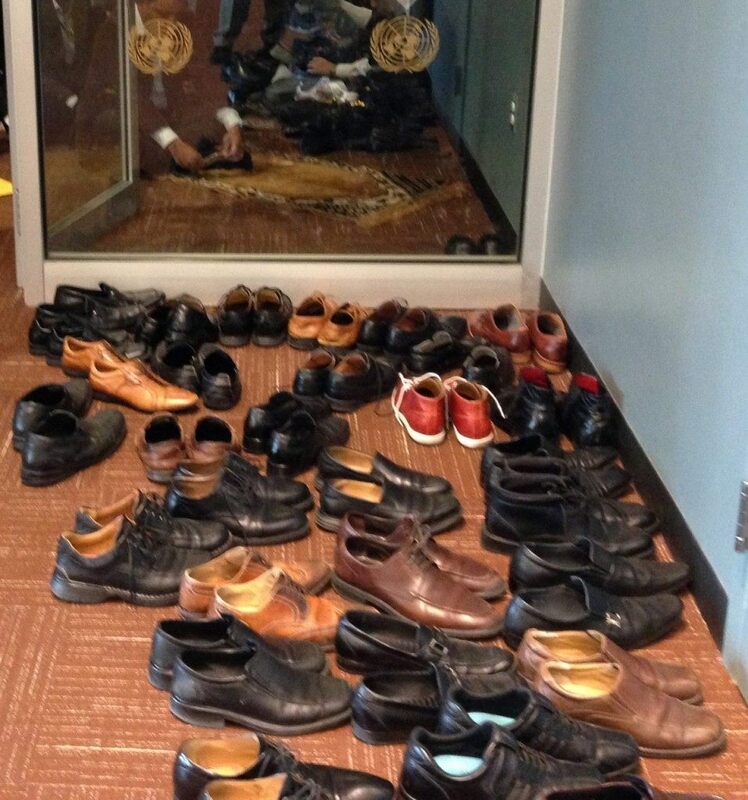 Muslim prayers are now so popular that they spill into the path of public tours, with upwards of hundreds of shoes lining the halls. By contrast, Christians, Jews, Hindus, and members of other faiths do not hold their regular services at the UN. 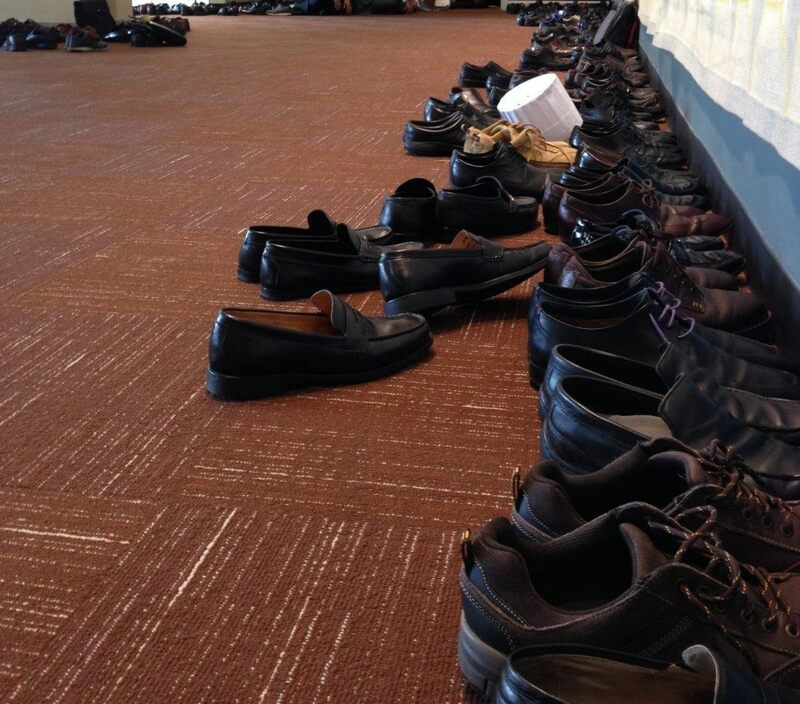 Evidently, just one religion finds the ecumenical room insufficient for its purposes. This despite a UN Charter that promises to reaffirm "equal rights," and to promote "respect for human rights and for fundamental freedoms for all without distinction as to religion." Not to mention the host country's commitment to the separation of church and state. American taxpayers recently contributed half a billion dollars to renovate the UN. Little do Americans know that their money funded space for Friday Muslim prayer services. The "Capital Master Plan" renovations, which ran for seven years until mid-2015, cost Americans $488 million, according to the U.S. Government Accountability Office (GAO). With our open wallet, the UN merrily went $379 million over budget, according to the UN - and at least $430 million over budget, according to the GAO. American dollars didn't just help renovate the space appropriated for weekly Muslim prayers. 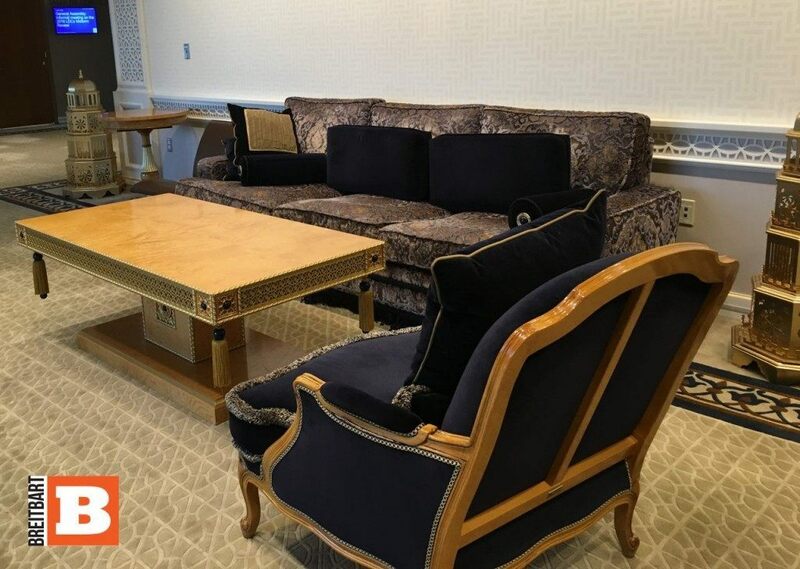 They also helped carve out an "East Lounge" that UN Secretary-General Ban Ki-moon called "perfect for behind-the-scenes negotiations." The decorations were donated by Qatar in 2013. The UN donations website claims that there was a renovation "policy" developed to govern spaces in the building that were "available for adoption" – but the policy is mysteriously unavailable. Perhaps it is the same policy that has resulted in the obscene repositioning of the UN's revisionist "Palestine" exhibit next door to the Holocaust exhibit. UN indoctrination isn't subtle, and it isn't cheap. With the Organization of Islamic Cooperation having colonized the place, perhaps it is about time somebody asked those wanting to be the next American president why we are paying for it. Two armed Palestinians were shot dead Sunday evening after opening fire on Israelis security forces outside East Jerusalem's Old City, in the fourth violent incident of the day. Armed with home-made Carl Gustav-style rifles, the two approached a group of police officers and soldiers at the Damascus Gate and began to shoot, but the forces responded with gunfire, killing the gunmen. No security forces were hurt. Police thwarted an attempted stabbing attack carried out by a female teenage Arab assailant near Jerusalem's Damascus Gate Monday afternoon, marking the second time in less than 24 hours that Arab terrorists have attempted to carry out deadly violence in the flashpoint area. At approximately 3:30 p.m., police patrolling the east Jerusalem entrance to the Old City spotted the unidentified suspect behaving suspiciously, said police Spokesman Micky Rosenfeld. "An officer stationed by Damascus Gate approached the female Arab teenager and asked her for identification, at which time she pulled out a knife and attempted to stab the officer," Rosenfeld said shortly after the attack. "Police were able to push her back and disarm her without anyone being injured. After searching her bag, a second knife was found." Rosenfeld said the teenager was arrested and is presently being questioned by police to determine if she acted alone or is part of an organized terror cell. "Security assessments are being made, and heightened security will remain in effect in and around the Old City to prevent more terrorist attacks," he said. Shortly after 11 p.m. on Sunday night, two Palestinian terrorists from the West Bank armed with improvised automatic weapons were shot dead in the same area after one of them fired on police personnel. "After the terrorists arrived near Damascus Gate, a police officer made eye contact with one of the suspects who was carrying a large white bag and proceeded to pull him over to ask him for his identification and search the bag for weapons," said Rosenfeld. "The terrorist opened the bag and pulled out an improvised automatic weapon and at that point the officer opened fire and killed him. The second terrorist then opened fire on police from 100 meters away, and units in the area responded by opening fire and killing him." None of the officers were wounded during the brief exchange, he said, adding that one of the assailants also possessed a knife. "We know that they coordinated on their own, but they are not part of a terrorist organization," Rosenfeld said. Noting the spike in attacks in the area, he added that extra police units have been dispatched to patrol in and around the Old City, with an emphasis on Damascus Gate.